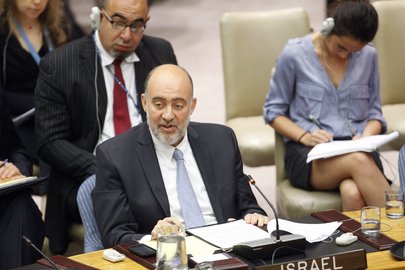 At UN, Israel's Prosor Riffs on Flopilla & Durban III, Repping Peres or Lieberman? Inner City Press asked Prosor at the stakeout about reports, or at least one report, that Israel would void the Oslo Accords if Palestinian proffers a resolution aiming at statehood in September. Peres has said “no,” and Prosor seemed to -- click here for video. The stakeout by Mansour is online here. On other UN topics, Inner City Press asked Prosor about the Durban III event scheduled for September 22, which the US, Canada, Italy, Netherlands and the Czech Republic are boycotting (although US Ambassador Susan Rice has dubbed it “non-participation”). Prosor said that while there are part of the Durban review process that Israel would praise, the anti-Semitic parts lead it to condemn and to ask others to. Inner City Press asked about the long delayed Palmer report on last year's Gaza flotilla. Prosor began by calling this year's on again, off again version the “flopilla." He then said that at Secretary General Ban Ki-moon's request, granted by both Israel and Turkey, the report on last year's flotilla is being delayed until August 22 to see if the sides can agree. We'll be here, for that and September: watch this site.